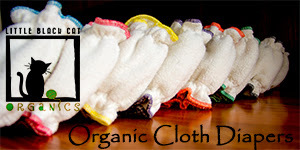 I'm so excited to finally be able to say I've tried one of the biggest names out there in cloth diapering! 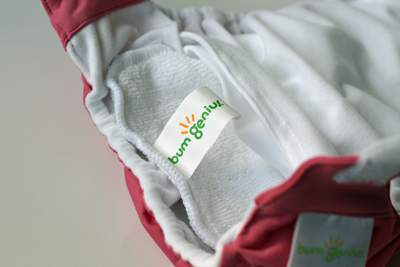 bumGenius is a name that's been around quite a while in the cloth diapering world. Their diapers have evolved through various different designs and models, and they've finally ended up with their super popular 4.0 version--this diaper has been my segway into trying bumGenius for the first time, care of Figure 8 Maternity, my lovely sponsor for this review! Up for review, Figure 8 sent me a bumGenius 4.0--a stay-dry pocket diaper in the gorgeous "Zinnia" color! This color is probably my new fav in our stash for our darling little Aurelia--it's so feminine but punchy and bold at the same time. I would say that this diaper is a "heavy duty" diaper that has great structure and workmanship. The velcro on it seems super-strength! It is thick and supersticky, which can frankly be both a good and a bad thing. The good is obviously that once put onto your baby (or your toddler, especially! ), it stays PUT! They could not easily fiddle with this velcro, and you won't find it easily snagging on clothing, etc and yanking free. The width and heft of the velcro does make the waistband of this diaper feel slightly less soft & flexible than the snap diapers I'm used to, though. The super-sticky feature of the velcro means that if you don't properly fasten your diapers before putting them in the wash, you might find yourself having to unsnag the velcro from a huge "diaper chain" or from other covers and laundry in the load. 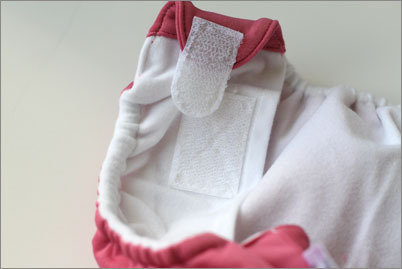 The bumGenius 4.0 does have AMAZING fold-back diaper tabs built in, though, just for the laundering purpose. Simply fold the tabs back before tossing into your pail, and these tabs won't move an inch while in the wash (they have never come undone yet for me). I did have to pick the occasional hair or lint out of the velcro band post-wash cycle, though. This diaper comes with two thirsty microfibre inserts (one newborn size, and one adjustable size for infants/toddlers). Although microfibre can have its issues over time (buildup & stink), I never have a problem with new microfibre inserts, and these ones have done a good job at staying white and fluffy when dried with my dryer balls over the past month or so. Over time, I know bumGeniuses have a bad rap for getting stinky with buildup or residue, so in the long run, I think stuffing the pocket with other bamboo or cotton inserts from my own stash will probably be best. For now, though, I'm happy with what came included with the diaper. I also love the generous pocket opening that is easily stuffed come folding time. A generous pocket is easy to stuff with a clean insert, and the soft microsuede liner is easy to clean! This diaper is made one-size by its adjustable rise snaps, and it should fit most babies from 8-35lbs. The outer PUL shell is snug and trim and has held up very well through my intensive laundering regimen (which even includes vinegar in every pre-soak--a big no-no, I know, but a step that is necessary for our household at this time!). Although (I confess!) I still love snapping diapers most, I love that this is a diaper that I can leave when daddy, grandma, or another babysitter is watching Aurelia for the day. Even for the cloth diapering faint of heart, this diaper couldn't get simpler to clean and use--it really does go on just as quickly & easily as a disposable--a definite plus once you've got a walker on your hands like we now do with 14 month old baby girl!! Overall, I now know why bumGenius is still one of the top names in cloth diapering today. Although the diapers do come with a bit of a larger price tag than some other overseas made brands, many customers feel that the 1 year warranty on each diaper more than pays for itself in terms of ease of mind that any problems will be remedied! And now, read on to see how Figure 8 Maternity is providing you with a wonderful opportunity to win a bumGenius 4.0 for your own baby! Head over to Figure 8 Maternity right now and pick up a bumGenius 4.0 for yourself! Figure 8 Maternity is also offering one lucky winner a bumGenius 4.0 pocket diaper in your choice of available color! Final details: I received financial compensation for this review or giveaway as well as receiving the sample item free of charge. All opinions shared are my own, and I was not persuaded to share anything other than my own thoughts. Other users may have different experiences with this product than what I have shared. This giveaway will end on November 6, 2011 at 11:59pm MST and is open to residents of Canada and the USA only. Winner will be chosen randomly using random.org’s services. The winner will be contacted by email and will have 48 hours to reply before a new winner is chosen. The prize will be supplied and mailed out to the winner by the sponsor of this giveaway. I liked Figure 8 Maternity and left a comment on their wall. 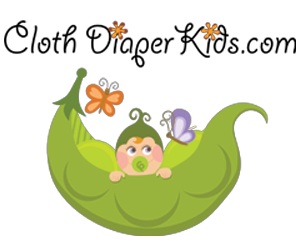 Voted for Cloth Diaper Contests & Giveaways. I'd be interested in trying a Thirsties duo diaper from their shop. Like Figure 8 maternity on Facebook (Sarah Jane). Like Cloth Diaper Contests and Giveaways on Facebook (Sarah Jane). I want a belly bandit! Follow @fig8maternity on Facebook (Sarah Jane). Just voted on picket fence blogs. Follow on Networked blogs (Sarah Jane). 10/29 Voted on Picket Fence Blogs. I like the nursing wraps at Figure 8 maternity. They're very stylish! I like Cloth Diaper Contests on facebook. I would love to try the Babymel Ella diaper bags from Figure 8 maternity! I subscribe to the CDC&G blog as weezermcdoo@gmail.com! I just LOVE the JW D&A Basket Weave Maxi Nursing Dress!! I want it SO bad!! Follow the Cloth Diaper Contests & Giveaways blog with Google Friend Connect as Vanessa Coker. ‘Like’ Cloth Diaper Contests & Giveaways on Facebook as Ps Mamae. I subscribe to email updates from the CDC&G blog. 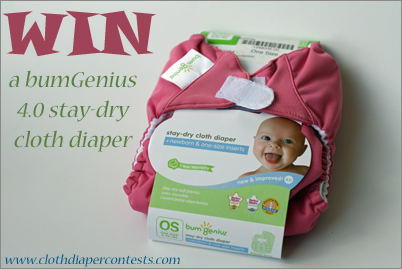 Liked Cloth Diaper Contests & Giveaways on Facebook (ID Jane Hofer). Love the Rachelle Soft cup nursing bra on the Figure 8 website. 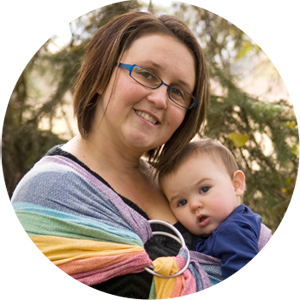 I would like the Tami 3/4 Sleeve Wrap Nursing Top! I would also love to try the L'ovedbaby Long-Sleeve Baby Girl Overall for my LO! 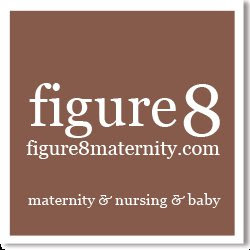 I follow @fig8maternity on twitter. I like CDContests on FB. Visited Figure 8 and like their Rabbit Moon French Terry Track Suit & Shirt.